Sebastian Vettel has hinted he is ready to help Red Bull team-mate Mark Webber win the world title at the last race of the season if he cannot do it himself. The German kept his chances alive by winning Sunday's Brazilian Grand Prix. But Ferrari's Fernando Alonso can finish fourth in Abu Dhabi and still take the title if Vettel wins, but needs to be second if Webber does. "In that scenario, it is something you will think of," said Vettel. "I think it's clear." Alonso finished third in Brazil behind the Red Bulls and is now eight points ahead of Webber and 15 ahead of Vettel. After winning at Interlagos on Sunday - to equal Webber's tally of four wins, one behind Alonso - Vettel said: "We will race hard and then see where we are. "In my case, it is pretty straightforward - all I can do is optimise my result, ideally repeat the result we achieved today and then it depends where those two guys are. "For sure, you will have to judge according to the situation. Both of us, we know how to react. We had some moments we're not very proud of and which we don't want to repeat." 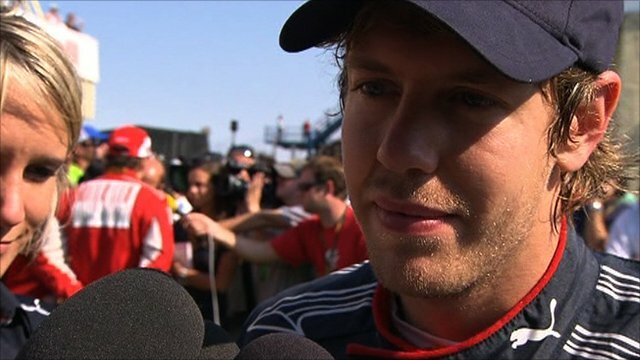 Pressed on the subject, Vettel added: "What do you want to hear? It is one week. As a kid, I never liked (it) when my parents teased me for something and didn't answer my questions. Now I am in a good position to tease you, so you will see." Webber said: "I think it depends how it is on the last lap." The subject of whether Vettel should back Webber's title hopes over his own has been bubbling away for a few races now. Red Bull have insisted that they will allow their drivers to race until the last possible moment, although team principal Christian Horner hinted here in Brazil that he would consider team orders in Abu Dhabi if that was the only way a Red Bull driver could beat Alonso. 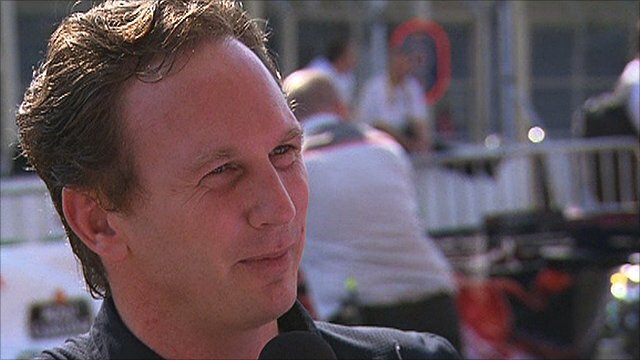 "The drivers drive for the team, they've received tremendous support this year, it would have been wrong to switch [their positions] today, we've backed them equally all year and it would have wrong to artificially take one of them out of the championship," he told BBC Sport. "Of course if we find ourselves in a situation where, on the last lap, the team and one of our drivers can win the world championship, the drivers will do whatever's necessary to ensure as a team we achieve the best result." Team orders are banned in F1, but Ferrari got away with a $100,000 fine when they gave a coded instruction for Felipe Massa to let Alonso through to win the German Grand Prix in July. The relationship between Vettel and Webber has been strained at times this season, and the Australian revived the tensions when he arrived in Brazil for this race by saying that he felt the team were more emotionally behind the German, and that his title challenge was "inconvenient". Asked after the race here if he felt Vettel should have let him win, Webber said: "It helps, but it's not in the team's philosophy, so that's how it is. "It was a good drive by Seb today and that's how it is. "Obviously, Fernando got some points in Hockenheim. That has happened in the past in F1 and it will happen in the future. Everyone has different ideas about that. And that's how it is at the moment. "I'm still in with a big chance so I'll go there and do my best." Alonso said he was "100% confident" about his chances of clinching his third world title in Abu Dhabi, to add to the ones he won with Renault in 2005 and 2006. "I just need to finish second," he said. "It doesn't matter who wins if I finish second. The main goal is to be on pole and win the race. If we cannot do that, we try to be second."